At some moment, most everyday, I'll think about my first car. And I'm not talking about the first car my parents let me drive.... I'm talking about the first car I ever bought and owned. It was a beauty.... a 1961 Nash Rambler convertible.... the greatest car ever built! Well, OK, that's up for discussion.... but it always will be my sentimental favorite. The photo included here is not of my car. I found this picture on the internet and -- other than being gray -- it looks the same. Mine was white, with a black top, a red interior, and a fine sounding AM radio. I bought it for about $800 in the fall of 1962, and I couldn't have been prouder had it been a Rolls Royce. My friends tried to convince me it might have a mechanical problem, since I got it so cheap. But truly.... it ran like a top. That old Rambler had a significant show-biz claim to fame as well. 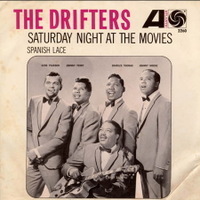 I think it was the summer of 1963 when I gave the Drifters a ride from the bus station. The Drifters were coming to Augusta for a concert that was somehow connected to the radio station where I worked. I hurried to the Greyhound terminal to welcome the famous singers to town. Well, they needed a lift, so we all piled into the Rambler..... me and the Drifters..... heading to wherever it was they were staying. That, my friends, was pretty cool! I must confess I was praying that I'd happen across a friend or someone I knew, just so I could say, "Hey, I'll check with you later, I'm hanging out with the Drifters right now," and maybe we would all launch into a verse or two of "Save The Last Dance For Me" as well. Yep, that '61 Rambler convertible was a great car. Well..... great, except that -- in 1964 -- while I was on active duty in the Army, and my then-girlfriend was driving the car back home in Augusta, the motor fell out. And I don't say "fell-out" as a figure of speech.... I mean the motor literally fell out in the middle of the street. Apparently a little mechanical glitch of some sort. The bad news was.... the Rambler was beyond reasonable repair. The good news was.... there were no future members of the Rock and Roll Hall of Fame riding in the car when the motor fell out. 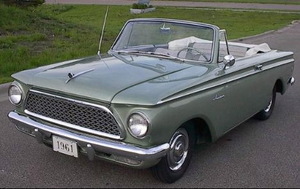 My second car....... a '64 Nash Rambler convertible.